On the evening of 20 August 1940, the same day that Winston Churchill made his historic ‘Never in the field of human conflict…’ speech before the British House of Commons, a man armed with an ice pick entered a house in Mexico city and struck down the occupant. The assailant was an agent of the Soviet security service (NKVD), a man named Ramón Mercador. 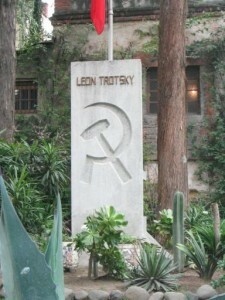 The victim was Leon Trotsky, the great revolutionary. He died the following day from his wounds. 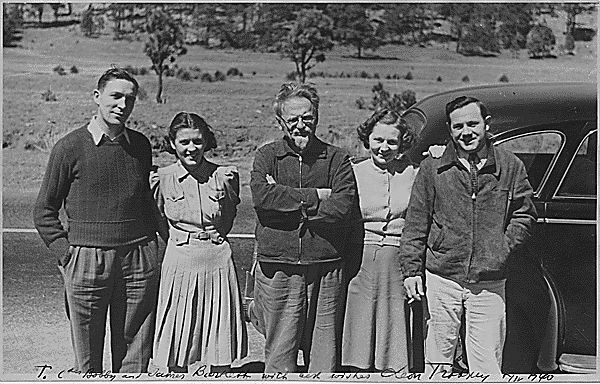 (The picture above shows him flanked by friends and was taken in Mexico in 1940). Trotsky had been a major figure in the Bolshevik Revolution and, afterwards, took control of the Red Army. The rise of Joseph Stalin led to Trotsky being expelled from the Party and sent into exile. The majority of his family were killed and most of his supporters were executed in Stalin’s purges of the 1930s. To the British, who were at war and embroiled in a desperate air battle, and to Americans, who were in the midst of a presidential election campaign, Trotsky’s murder was of little consequence. Stalin had settled a score with an old rival. Maybe Hitler took notice. (He worried, with good reason, about assassination). This entry was posted in World War II and tagged Bolshevik, Churchill, Hitler, NKVD, Stalin, Trotsky. Bookmark the permalink.